Holiday movies available on DVD or streaming. As the holiday season approaches, I felt it was a good time to discuss some of the good holiday films available. This week we'll discuss some of the films with holiday themes that are available on DVD or streaming. Who knows, this blog may even inspire a gift or two. From the old classics to more contemporary favorites, these films are always welcome during the holiday season. These are in no particular order other than alphabetical. A Christmas Story - A somewhat modern classic, that is often quoted around the holiday season. All Ralphie wanted was a Red Ryder, carbine action, two-hundred shot range model air rifle, is that too much to ask? 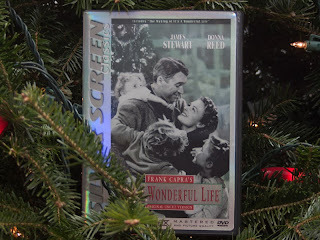 It's A Wonderful Life - Although it's on TV every day of the holiday season, this is still a great story. George Bailey (James Stewart) believes that maybe everyone around him would be better off if he had never existed. He is given the chance to find out how wrong he is. It may have it corny bits, but the sentiment holds up still more than 65 years after it was released. Miracle on 34th Street - Another oldie but goodie is the one from 1947 (there have been a few remakes). After a run-in with an incompetent company psychiatrist, a department store Santa is forced to go to court in order to prove that he is in fact the real Santa Claus. Scrooged - Yes, another retelling of the classic A Christmas Carol, but this one is funny and has Bill Murray. Bill Murray plays Frank Cross, a mean-spirited TV network president, who is trying to put together a live retelling of The Christmas Carol that appeals to every demographic, including cats. Carol Kane has a very funny take on the Ghost of Christmas Present. If you're not already in the holiday spirit, these films might be able to help. Wishing you and your families the very best this holiday season.